I read with interest the recent letter “Flip-Flops and Spinal Catheters” published in the February 2018 APSF Newsletter. In it, Dr. Schloemerkemper presents some practical system issues related to a resident placing a spinal catheter after an accidental dural puncture during placement of a labor epidural at her institution. Dr. Schloemerkemper focused on the resident’s choice of an accepted, but unfamiliar technique. From a human factors engineering perspective, her solution: expect the resident to use better judgement in the future, should be reconsidered.1 In fact, a closer look might reveal a system error being lack of supervision. I wonder, should we as anesthesia professionals treat the induction of labor epidural analgesia like we treat the induction of every other anesthetic and require an attending anesthesiologist to be in the room? I believe our job is to teach residents how to navigate unfamiliar situations, and laboring parturients deserve the same level of care as surgical patients. Dr. Norris has no disclosures to report. Cobb BT, Lane-Fall MB. 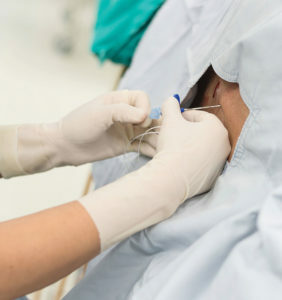 Learning from human factors can make anesthesia even safer. Anesth Analgesia 2018;126:382–382. I thank the editors for allowing me to reply to Dr. Norris’s comments. I agree with the quote indicating that a good person can be beaten by a bad system. Supervision can help defeat the odds and prevent a negative outcome. Nevertheless, the scenario I described highlights an issue that is independent of training experience or supervision. If we want to improve a “bad system,” we have to identify it first. We also need to recognize that our work environment might differ from what we have read in the literature. Critically reflecting on the circumstances is something that needs to be encouraged, not just during residency but beyond. We have used the described scenario as a catalyst to create local guidelines regarding intrathecal catheter use. UCDavis Medical Center, Sacramento, CA. Disclosures: Dr. Schloemerkemper served as a consultant for Covidien and Mizuho OSI.